How was your weekend? I had a lovely time at home with my family. But now its back to the grind, and with this cooler weather means an extra layer when you step outside. 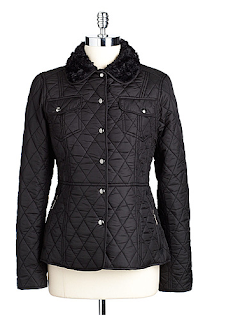 One coat that is always my go to for fall is the quilted coat. It's simple, a bit preppy and easy to throw in your bag. But don't worry, I know not everyone is as preptastic as I am, so let's mix in some edge. Yes, edgy quilted. Well, did I deliver? 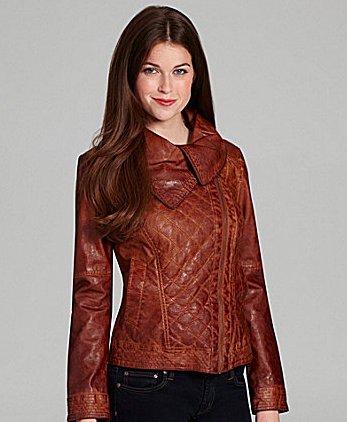 A stunning hooded motorcycle jacket that has a great quilted detail. I can picture Nikki in this jacket! Gap nailed it here. The belt is a great way to define a waist to an otherwise masculine coat. I really love the color of this coat. The fold over collar is something different as well as the off center zipper. If you don't want a belt, look for a coat with a beautiful waistline like this one. See? Quilted doesn't have to be stuffy. You can mix in leather, a hood, and color. Something for everyone.